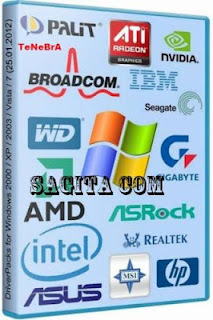 SAGITA COM - SAGITA COM - Hello sobat SAGITA, jika beberapa hari yang lalu kami telah memberikan Kumpulan Master ISO Windows untuk kali ini giliran untuk share DriverPacks For All Windows. DriverPacks adalah kumpulan drayverpakov. Terakhir diperbarui driver - 20 Februari 2012, Anda juga dapat menginstal driver secara manual setelah menginstal Windows. In the properties of the device you want to install the driver in the "device instance ID" search text DEV_ **** (instead of 4 stars - 4 numbers or letters). Search (eg searching in total commander) contents drayverpakov files *. Inf text DEV_ **** (instead of 4 stars - your 4 numbers or letters). The search result will show you which folder / folders are most likely the correct driver for your device.